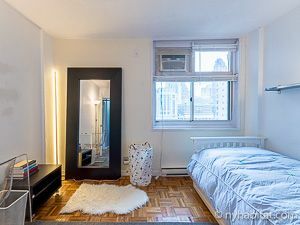 This room for rent is in a 3 bedroom/1 bath shared apartment on Roosevelt Island, an island located in the East River between Manhattan and Queens. 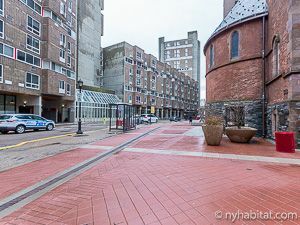 Roosevelt Island connects to both Queens and Manhattan by the F subway line, which has a Roosevelt Island stop. 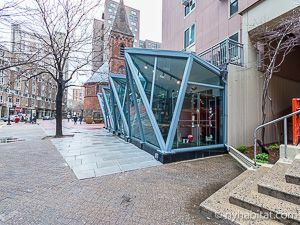 It also connects to Manhattan via the Roosevelt Island Tram. 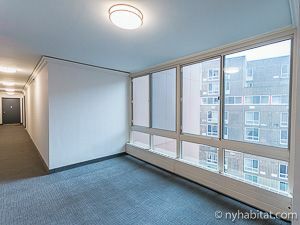 This apartment share is located on the 9th floor (8th floor European) of a high-rise elevator building with full-time doorman. Laundry facilities are located in the building. 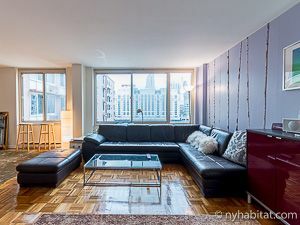 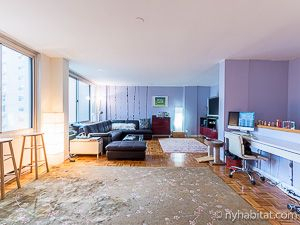 Make your home on Roosevelt Island in this shared apartment with a room for rent. 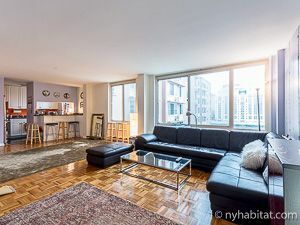 The spacious shared living room has a sectional sofa to lounge on and watch the flat screen TV, mingle with your roommates or just enjoy the New York City views from the windows. 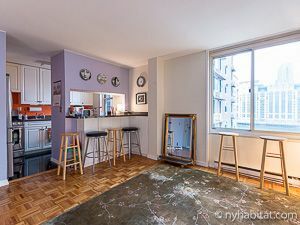 Pull up a bar stool at the kitchen countertop and enjoy a snack. 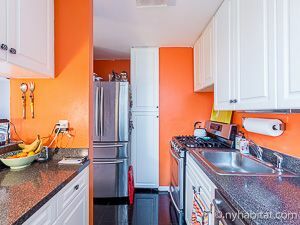 The shared open kitchen has white cabinetry and bright orange walls that add a pop of color. 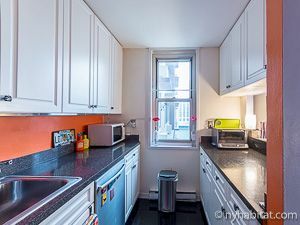 You’ll find the kitchen fully-equipped with stainless steel appliances including stove/oven, refrigerator, microwave, toaster and dishwasher. 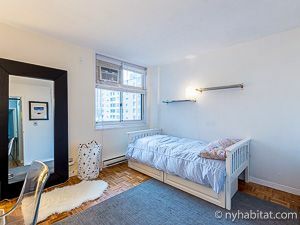 The private bedroom for rent is furnished with a twin size bed and a full length mirror, along with a desk and chair for getting some reading or studying done. 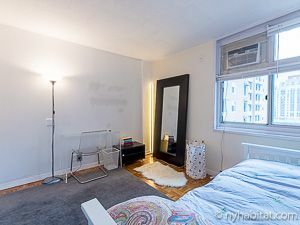 There is an air conditioner to cool the space and the window provides city views. Store your belongings in the custom closet that provides hanging and drawer space. 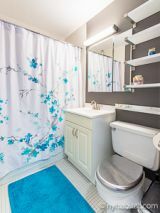 The shared bathroom has both tub and shower, along with a toilet, mirrored vanity and sink with cabinets beneath. 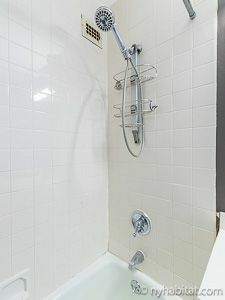 Gas, electricity and wifi included.